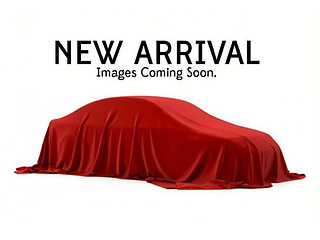 Enhanced Performance, Sunroof, Navigation, Leather Seats, Heated Seats! Luxurious comfort, thrilling performance, and stand-out style come together seamlessly in this striking Infiniti Q60. 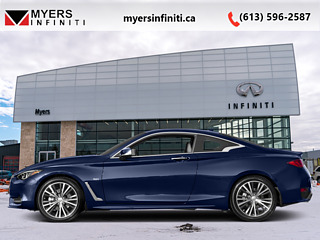 This iridium blue coupe has an automatic transmission and is powered by a 300HP 3.0L V6 Cylinder Engine. 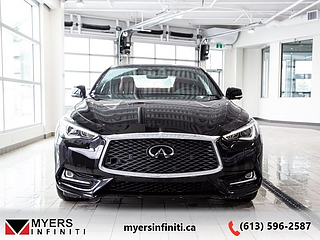 Our Q60's trim level is 3.0t SPORT AWD. 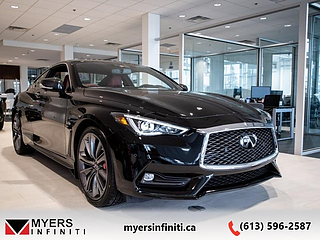 This Q60 Sport really kicks it up a notch on the road ripper front with silver S badging, memory passenger seat, paddle shifters, adjustable sport suspension, sport brakes, and carbon fiber trim. Interior features still include the InTouch dual display infotainment system, navigation with lane guidance, SiriusXM, voice recognition, Bose surround sound system, Bluetooth, and USB and aux jacks. More features include moonroof, semi aniline leather seats, memory driver seat and side mirrors, heated front seats, leather steering wheel with power tilt/telescope, predictive forward collision warning with emergency braking and pedestrian detection, steering wheel mounted cruise and audio controls, navigation synced adaptive shifting, dual zone automatic climate control, intelligent key with push button start and remote start, InTuition stores driving preference in each smart key, rearview monitor, aluminum wheels, heated side mirrors with turn signals, LED lighting with fog lights, and door touch unlock. 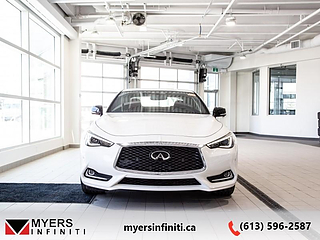 This vehicle has been upgraded with the following features: Enhanced Performance, Sunroof, Navigation, Leather Seats, Heated Seats, Memory Seats, Premium Audio System. This is a demonstrator vehicle driven by a member of our staff, so we can offer a great deal on it. Buy this vehicle now for the lowest bi-weekly payment of $428.97 with $0 down for 84 months @ 5.99% APR O.A.C. ( Plus applicable taxes - and licensing fees ). Incentives expire 2019-04-30. See dealer for details.